Who am I, and what do I write? baking, writing, and banana loaf!! Scribble down the first ten words that come to mind. baking, hoovering, cleaning, ironing. shopping, money, benefits, banana loaf, writing. Pick three of them as your blog title. Now write!! My ‘ten words’ are my rather hotch-potch to-do list for Friday, just gone. Not being very together in recent days due to a medication increase, I have to be kind to myself and take things one day at a time, while sleeping lots and trying to handle whatever the day throws at me. It’s fitting that there was a ‘daily prompt’ to match my mood. I love baking. It is a hobby that lifts my mood, however I am feeling, and there is something delicious to eat at the end of it. It also makes me feel ‘normal’, connects me to the side of the family who bakes, and uses leftovers! What’s not to love?! On Friday, I made banana loaf, which I have made many times before. It is one of the foods on my ‘snack list’ from my dietician. I adapt it to have half wholemeal, half white flour in and use buttermilk to give it a unique taste. I do follow a recipe to make it though. Today I made soda bread and rock cakes with cranberries instead of raisins, and half a teaspoon of jam in the middle. I was supposed to do lots of writing to do this weekend, as I think I explained in my previous post. Firstly this blog post, a competition entry for Tearfund’s magazine, a testimony piece, and a blog post for ‘Big Bible’. Instead, I did lots of sleeping. I wish I could say I felt better for it, but this morning, it took me a long time to wake up and every part of my body ached. Over the course of the day, it has eased a little, meaning I can get on with the writing, but I may just eat a couple of jammy buns to ease the rest of the aches and pains, and keep me on task! What have you been putting off doing? Why? There are all sorts of things I put off doing, and all sorts of reasons for it. On my ‘good’ days I get a few things done, and I have resolved to also do a couple of things on those days which I may have put off. On bad days however, my “shoulda, woulda, coulda” list just gets longer. Things that I think I can put off I do. The trouble is, not being an organised person there is no logical reason things end up on that list, even things that should only take a short time to do. Even on the good days, I never know when I will need a nap. At the moment this is a ‘good’ day, or at least a good morning. I will be exhausted by the afternoon. If I only prioritised things that really needed doing I might be more organised, but I would never get anything done that was just for me. Other days, like yesterday, I fully intended having a writing day, as horse-riding was cancelled. However, I craved company, and sat watching day-time television for several long hours. This morning, I finally attempted a short story, which I had put off doing, as I genuinely didn’t think my efforts would be any good. The last one I wrote was more than ten years ago in my first year at university. I have other writing projects to attempt. The magazine Tear Times is running a writing competition, and their editor Peter Shaw tweeted me to let me know, and ask if I had seen it, and if I would think about entering. I was very daunted to even begin, and I at this point I have only written a very rough first draft, having forced myself to write something very late one night, having taken several days to think about the brief. I am worrying my entry will not be up to the standard of the others! This is something that plagues me and one of the reasons I put off starting a blog for so long. However, some lovely people have said some lovely things about my writing, so I am beginning to have a little more confidence with it. I also have a 500-word testimony to write for Christian disability charity Through the Roof which I have put off as the deadline is after the one for ‘Tear Times’. I have a head start on it as I previously wrote a testimony of the same length for Christian Radio Station UCB, which was read out by Mike Rimmer as part of a section called ‘My Story’. The big project I have really been putting off doing, however is this: For several years, various friends have suggested I write a book. The very idea terrified me. Who would want to read it? Now I have written a blog on and off for a year, and a had a not very subtle push from specific friends, I am beginning to think about it. However, old habits die-hard. I am still tempted to shrink into the background again. Even short blog posts are such an effort most days. However, others who have recently submitted first drafts, or who are currently writing them, have inspired me too. I have yet to decide what style of book it will be. This I do know; that I will write about what I know… and my faith in Jesus will also play a part. Without measures of healing throughout my life, I would not be here. I am on roughly my 7th or 8th chance at life. While at university, particularly the first time round, my ability to procrastinate was well-known. I was the Queen of Procrastination. To my shame, I admit I submitted some essays late which horrifies me now.A friend once bought me a ‘little book of procrastination! Were I to start over, I would want to do things completely differently. I would always start each year, or even each semester with that intention, and every semester I would fail spectacularly. Ill health had a part to play in this, as this was round the time hospital admissions began. I was also starting to struggle with my mobility and be in more pain, and it was three years before I sought help from a learning assistant for things like typing, accessing the library and so on. I didn’t think my disability was ‘bad enough’. I did not want to admit to myself how much I was struggling. However, I began to have panic attacks. Eventually I gave in and accepted some help, however, it did not really help with my lack of organisation. Even during my Masters degree I had all the same struggles, despite best intentions to the contrary. Ill health also had a part to play as I got poisoning which put me in isolation in hospital, and exhausted me for months. However, none of this ever sat easily with me. I read a bible study about procrastination very recently which said Christians have no excuse for putting things off. Even though I know this, it still has a hold over me. Whenever I do manage to complete a ‘To-Do list, or even the majority of one, I do feel a sense of achievement. Failures from the past still haunt me. I think “I managed so and so, but I didn’t manage this, that or the other…”. I have started to use the ‘schedule’ feature on WordPress, so I can write posts one day, but they are not available to you until a couple of days after that. I hope one day, to conquer this bad habit of mine, with Jesus help. Until then, however, i will still have my “shoulda woulda, coulda” list. As for when you can expect the book, your guess is as good as mine. You do have my word I will start on the book soon, though just remembered a monthly writing commitment…! Will I ever beat procrastination?! The bright colours of the playground are at odds with this little girls mood. She shouldn’t know how to think this deeply this young. Weighed down with care, she has few friends. The green creature is the stuff of her nightmares. She knows nothing of Pinocchio, a friendlier creature with a similar length of nose. She should bounce with Tigger, and eat honey with Pooh, but no-one will read her the story. This little girl used to dream of a better life. What it might feel like to have a mommy and daddy who loved her, read her stories and played with her. Instead, some days she has to scavenge for food. She does her best to hide, not wanting anyone to notice her for fear of what will happen if her momma is in one of her moods. There are no scars on her face or her arms as they would be noticed by others, and then they would know. She is waiting for her momma to come out of the building next to the roundabout. She would rather sit there forever and not go home with her momma, but go home she must. Maybe one day, she will escape the horror, and the pain, but what if someone never notices her? What if someone does notice the little girls withdrawal, and the heaviness on her heart, and raises the alarm? Maybe then she will find a family who loves her, plays with her, and feeds her home cooked meals. Maybe then she will learn how to dream again, but we will never know. I wrote this (very) short story for the Weekly Writing Challenge. I was to write a story based on the picture above. It was my first attempt at a proper story in a very long time! I am sure you can do better! I would love to read it! 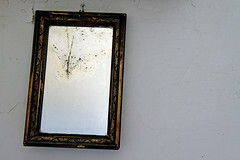 Think of your blog as a mirror: what does it reveal? Consider your blog name, theme choice, design, bio, posts… what does every element tell you about yourself? The title, ‘sat n all that’ was actually thought of by someone else. One of the carers, actually who I don’t see now but they used to have loads of shifts with me. The blog started as a project to take my mind off things round the time I was struggling to adjust to changes in my circumstances, and to give me another purpose to my day. I find it a little easier to think of titles now, but found it impossible in the beginning. The title started off as ‘I may be sat, but I’m all that’, but I felt it wasn’t snappy enough, and wanted to write about more than just being sat in a chair, or only about disability issues. After all, my life is more than these things. My life is not nearly as varied as I would like; ‘special someone’ is no longer on the scene, I am unable to work, and I’ve even had to cut down on the blogging, to keep up with it. However, I have amazing friends, a great church family, and have more interests now, so do still have variety of people of things important to me to write about. The design started as something else, though I can’t think what it was now. When choosing a theme, I wasn’t really bothered about the aesthetics. I wanted something clear and easy to read, so as wide a range of people could get access to it as possible. As ‘barrier-free’ as it could be without designing a site myself from scratch, as a few friends use screen reading software, and I wanted anyone who read it to be able to get access to it on whatever device they use to surf the web. That says a lot about me, really. I’m an open, friendly person, and I find a lot of purpose in reaching out to others, in whatever small way. Plus, a lot of disability access is an afterthought, and not from the outset, and I wanted to think about it from the beginning. The theme is trickier. I like the idea of being a ‘niche’ blogger, and I guess I am in some ways as I write about disability, or faith, or more often, disability AND faith, together. Both are integral to my life, and intertwined in many ways. My faith in Jesus is central to helping me cope with my challenges, and my challenges deepen my faith. I didn’t want to write narrowly on just one theme, as I lacked the confidence to think I could come up with posts easily enough on just one theme… plus, as I say, I couldn’t really separate the two, so I am much happier with a ‘hybrid’ blog. I think, now the blog is a year old, and though there have been stretches of about a month at a time where I have written little, I am more comfortable with the themes I write about these days. If you look at the ‘tag cloud’ to the right of a post, the topics I write about most are in bigger letter than subjects I write about less often. At this time, the topic in the largest lettering of all is ‘disability’. I am not entirely comfortable with that, as there are so many bloggers out there with a disability, people who have campaigned for years, advocated for others, been active in politics, and really know their stuff. I feel so intimidated by that because I worry so much that their writing on disability issues is so much more informed than mine, and what right have I to write about it so often when any of them can do a better job? This is partly a complete lack of confidence, and a desire that if I bother to write at all I want to write informed, quality content; otherwise, what is the point? I guess it is partly about perspective too. It sounds idiotic to point this out, but obviously no two people who live with a disability will have the same views even, on their disability, so it stands to reason both will be able to offer different perspectives. I find it absolutely unbelievable that my most popular posts have been disability related. The first post to which substantially more people read, and the first shared more widely, was one I wrote at the end of last year, about David Cameron’s speech at 2012’s Party Conference. Specifically, focussing on two little words he used: ‘Compassionate Conservatism. Now, a complete oxymoron…!! This particular post was also (he claims!) read by my MP, – WOW! My most popular post ever, I wrote very recently, about not being able to work, and trying to address the popular thought that if some severely disabled people can work, then why can’t every disabled person do likewise. To my amazement, this post was shared around upwards of 100 times, and has been viewed 400-500 times, at least! I’d never have thought my most popular post would be about these things, rather than something completely personal or something faith-related that I feel I know more about. I suppose I just am ‘myself’ when i write, as much as anyone can be, of course. Another post read a lot is ‘The days that changed my increasingly complex life.‘ It was the first time I wrote about something really personal, and what I thought and felt about it too. The reaction to it really surprised me, as some people got a lot out of it. Those kind of posts seem to be the ones that really strike a chord with people; again, something that surprised me. It was reasonably natural, though tough, and painful, to write about, as I am very much a ‘heart-on-my-sleeve’ person. In some ways, the people who read this blog have shaped what I write about. I used to answer more of the ‘daily prompts’ provided by WordPress, as i lacked the confidence, and often the inspiration, to come up with my own topics. This has got easier as time has gone on. Also, given the squeeze on welfare claimants that is about to get so much worse, the stereotypes peddled by the Government, and some sections of the media, and the ‘hot potato’ that is the Welfare State, the topics offer themselves at the moment, and it is also topics that are a big part of my life, whether I want them or not. No benefits, no money, therefore no independent life. As my Mum says, they didn’t bring me up to sit on the sofa for the rest of my life… so I really value the semblance of a life that I do have, and it gives me much more to write about than if I sat on the sofa the majority of the time!! I wrote the following for ‘Five Minute Friday’. Right at this point in time, I feel small. Not small as in small child, but small as in not-very-tall, not very strong, and not very clear of mind. It is linked in with the previous entry I posted this morning. With missing someone buckets with whom there are memories… lots of fun, and laughter, private jokes and common interests. An adventure which had only got going and came to an abrupt end. For a long while only numbness, now, only pain. Small people actually help me find my smile… little ones in the local supermarket who are gurning, until they see my chair, and watch, fascinated, trying to work out what is going on, or the little one in the chair in the street, leg stretched in front of her, her bright pink cast protecting her poorly leg, and a big smile on her face. These precious ones make me feel better, and wish I was small again, when I didn’t know grown up pain. When was the last time you really stood out in a crowd? Are you comfortable in that position, or do you wish you could fade into the woodwork? The last time I stood out in a crowd, I was with ‘special someone’, who I have referred to somewhere in these pages before. Nowadays, if I am in either wheelchair, I don’t stand out so much because there are so many scooters and wheelchairs around, especially in the likes of the newest local shopping mall. Except, whenever I was out with with special someone, as you don’t often see someone in a chair holding hands with a boyfriend or girlfriend. I once saw a young woman about my age holding hands with her boyfriend. I remember her because she had exactly the same make of chair as I had previously. It struck me at the time how natural they looked. Unexpected, and yet totally ‘normal’ at the same time. That’s kind of how I felt being out and about holding hands with special someone. We must have looked really odd in the middle of the crowd, especially given my youth, as it is fair to say the majority of scooter users at least are ‘of a certain age’. It also means even my neighbours ask after them because they remember looking out of their windows and seeing us holding hands – unusual enough that they remembered. Even more people I have to tell that we are no longer an item, just increasing the pain. However, I have to say, looking back, it was the one time in my life I did not mind standing out sitting down. Below is my thoughts on Channel 4’s ‘Benefits Britain’ programme, aired 12/08/13 at 9 pm. If you live in the UK, I am sure you can watch it online. Be warned, this post contains spoilers! You don’t have to have seen the programme to be able to debate the issues raised… this is currently a ‘hot potato’ about which nearly everyone has an opinion. Would love to know what happens in other countries too, when people are unable to work, for whatever reason. I have to admit, I was rather skeptical whether Channel 4’s latest programme about the problems with the Welfare State would prove anything. This time, they went back to 1949’s rules about who should, and should not, get benefits. For television’s sake, redecorated a couple of buildings to look similar to 1949’s equivalent of Jobcentre Plus, and gave the 1949 rule-book to a couple of welfare assessors with 60 years experience between them. It was interesting how much tougher the rules were. If you had paid into the system, you got the equivalent money you would have got in 1949, which meant initially that Melvyn and Karen got money, and young Craig only got emergency money of about 7 pounds for a week. What of Karen? Overweight, with diabetes, heart problems, arthritis, and the rest. She did not welcome the benefit assessor “‘spying'” on her, or the intrusion into her life, but it did transpire that her son did almost EVERYTHING for her. What kind of life does he have? He’s an adult with his own life to live. This kind of thing makes me very uncomfortable, even more so where younger, teenage or child carers are involved. Twitter was not kind to Karen in general, especially when her attitude was on show, and the swearing started. The medical was interesting too, as it asked her to do practical tasks which actually have a bearing on real life! Invisible disabilities were not recognised in 1949, as I expected. She was judged to be capable of ‘light’ part-time work. I’m sorry, but even I do more than Karen round the house and that’s even though I have carers to do the really difficult things. It’s wrong to compare disabilities, but I live with chronic pain, like she does. There is nothing for it but to get on with it. I was hoping the workshop type environment would help her, but she refused to do anything, instead breaking down in tears. I am glad the public have seen how being contant agony can wear someone down, as it is something which can have a profound impact on your quality of life. However, this will be lost on people because they were too busy judging her weight, and saying all she did was sit on her bottom. The last bit was true. It is very difficult to lose weight when you have mobility problems to begin with, for sure, but diabetes and so on does not have to be a disability. I know people with severe diabetes who work or have worked all their lives. I think part time work would help her self-esteem and her confidence, and give her something to focus on besides the pain. It is true that if she were judged capable of doing some work in 2013 she would not be on full benefit, as disability activists have rightly pointed out. Pain does play absolute havoc with your ability to concentrate and all the rest of it. Karen in a vicious cycle by the looks of it, similar to myself. You are in pain and unhappy so you eat, you are unable to burn it off, so you put on more weight, then you are in more pain, so you are more unhappy and you eat more… you get the idea. She needs specialist intervention to help her manage it all and lose weight, but it’s easy to judge when you only see edited snippets of someone’s life on a television programme. However, her attitude really did not help her, and won’t help her in 2013 either. My friend Sue Marsh (@suey2y) thinks the producer specified which kind of people s/he wanted for the programme in order to stick to conventional stereotypes. It is true that Karen’s character at least was a stereotype; but she has gone further than this and said “Showing someone bedridden told they must attend WRA (work related activity) wld have been explosive”. This may be true, but someone laid in a bed with an invisible disability would be open to the same accusations that Karen was, of faking or exaggerating the extent of the disability. Also, if Twitter did go crazy, the press would swoop, and after the 5 minutes of interest in their story the person would be dropped for no longer being interesting. In my opinion, it is the luck of the draw who reads the medical form which describes how your disability impacts your life – I got someone who understood, and I also had lots of pages of close handwriting explaining everything. Someone also said on Twitter that each person was a stereotype: an older person forced to go into a home; a wheelchair user, and a ‘malingerer’ with invisible disabilities. The final participant, Craig, , who has spina bifida and uses a wheelchair, was completely lovely. Initially he only got emergency help of £7 something as he has never worked. Not because he didn’t want to work. He was completely capable, but had just never been given a chance. However, he was given a training allowance similar to his benefits now, a medical, which rightly judged sedentary work to be best, and a day’s work experience in a call centre. He did brilliantly. More of that later. 1. Disability quotas, introduced after the war and abolished in the 90’s once the Disability Discrimination Act came into force in 1995 forced employers to take on a certain percentage of disabled workers. If they refused, they were punished accordingly. Equally, the numbers of disabled people of working age in work was much higher, about 94 per cent compared with just over 40 per cent today. It was heartbreaking to see the likes of Craig, lovely, with a great attitude, who desperately wanted to work, unable to get even work experience in 2013. He had never worked, so had no work experience, so could not get a job, a vicious cycle he could not get out of however hard he tried. However, the 1945 system gave him more results – work experience, and a job offer, which he gladly accepted. Should ‘disability quotas’ be reintroduced into the workplace? 2. The issue I discussed in my previous post, that one system of assessment does not fit all. There was no “‘mass production'” but instead, a completely individual, ability based approach was put in place instead. Of course, they were dealing with much smaller numbers in 1945, and mostly war-wounded or industrial industries, which is completely different to someone with multiple impairments today where it is hard to say what work is suitable if any. Of course, I would not have survived birth in any age before now, nor would most of the babies born with multiple impairments who will never be able to work. They simply would not have survived. There are debates to be had about how much intervention is too much, and what constitutes quality of life. However, that is a debate itself and for another time. 3. As was mentioned in the programme, some of the impairments which Karen had existed, but were simply not recognised. The female assessor asked at the end of the programme whether it was right that 2013’s sickness and disability recognise a wider range of impairments. People are living longer, and therefore develop more complex health needs, and the state cannot afford to keep giving out. However, where do you draw the line? I bet if you asked people on the street that each person would give a different answer. Twitter was vocal, and almost unequivocal – Karen was ‘fat’, ‘lazy’ and ‘should’ get a job. That’s putting it mildly. To give you an example, @CavanaghJess said: “Being overweight and diabetic is not disabled love. GET A JOB! !” As was pointed out on twitter, if she was ineligible for benefits they would have been taken off her, or not given in the first place, but her situation does raise difficult questions. We ignore them at our peril. Someone on twitter did question whether Karen could work in a call centre, but she could work in an office if she had voice activated software that would answer the phone for her, and she could speak to the computer what she wanted to say and software would type. She might be eligible because of her chronic pain and arthritis, however, Access to Work, the Government Grant scheme which pays for help an equipment disabled people need in order to work no longer provides this, so it would depend on whether an employer was prepared to pay the costs. If a small business owner was faced with a choice between someone healthy, with a compliant, friendly attitude, who was prepared to work hard, or someone who needed adjustments made and potentially expensive equipment bought for them, there is no way someone like Karen would have a chance of employment. At the end of the programme, the three guinea pigs, sorry, participants all met up and were asked by one of the assessors who they would give the benefits / allowance to if only one of them could have it. Melvyn, the pensioner said Craig was more deserving than he, despite his tough experiences in the programme. However, Craig refused. Karen then kicked off and said she had more wrong with her than Craig and therefore deserved it more. Karen and Craig both had different attitudes to their disabilities, and it really showed. The two assessors both had questions at the end of the programme. One, questioning that there’s something really wrong with a system if it cannot provide for the most vulnerable (hear hear!!) and the other assessor questioning whether the range of conditions considered for help was too large, and questioning whether the system should keep giving handouts. Would love to know what you think! There was a lovely moment at the end of the programme where the ‘assessors’ gave Melvyn back the watch he had pawned in order to survive (his grandfather’s) but many others have to do the same, with no one to buy it back for them. Follow me, you know you want to! Change how you cook and still enjoy what you eat. Be healthier by cooking in a different way. A pause to think about life, faith and parenthood. Fighting Dystonia, Chronic Lyme, EDS Type 2 & more... any questions?